In all honesty I did not expect to be writing this today! Yet, despite only a week’s turnaround, teams still managed to bring some bits and pieces to Abu Dhabi this weekend. With 2014 certainly at the forefront of everyone’s mind now, most (if not all) of the updates in this article will have been created with the intention to possibly be placed on next year’s car. Williams have always been plagued by their Coanda exhaust system, despite the fact that other Renault powered teams (mainly Lotus and Red Bull) have had a lot of success with the engine-exhaust combination. At the last pre-season test in Barcelona, Williams introduced a full-Coanda ramp system that aimed to emulate the designs from Red Bull/Lotus. The cost to produce this system must have been extortionate and it failed to produce consistent downforce at the rear of the car. 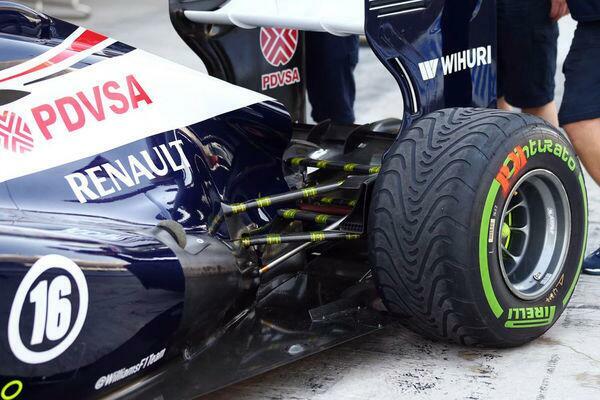 Pastor Maldonado described the FW35 as “undriveable” on many occasions even before the season had begun. The team then reverted back to its older specification semi-Coanda layout that is composed of an exhaust exit hanging over the floor and a gap between the exhaust exit and the rear tyre that the gases eventually reach. This produced consistent downforce and made the rear of the car much more predictable although the performance from this component has never been as strong as other teams. In Abu Dhabi, the team were testing a basic exhaust package to try to replicate the effect of having an aero neutral exhaust exit for 2014 (the exhaust pipe must exit at the centre of the car below the rear wing between 0 and 5 degrees). The exhausts on this package exited along the sidepod line and had no influence on the floor. However, the drivers preferred this package to the current semi-Coanda system and chose to stick with it for qualifying and the race. This is quite a staggering discovery: the fact that after two years of development work on the current exhaust system the team chose to run a very simplistic solution is not a good sign for Williams. Aerodynamics seem to be the Achilles’ heel for the team of late and I should think that they will be trying to lure the services of Ross Brawn from Mercedes to rebuild. Bringing in Felipe Massa (along with engineer Rob Smedley) wouldn’t do them any harm, either. Some quite large scale updates appeared on the F138 for this weekend although they may have been aimed at 2014 development. Ferrari have combined two vertical fences with a horizontal, downwash aiding blade that attaches to the sidepod airflow conditioner. We have previously seen just a horizontal blade stemming from the conditioner across the top of the sidepod before attaching to the cockpit side. The F138 has, surprisingly, never featured Vortex Generators (VGs) on its sidepods so seeing something similar to them this late in the season is quite strange. At first I thought the two fences were VGs but then, thanks to a helpful reminder in the comments section, I was proved totally wrong (I find this ironic as I produced a piece on vortex generators). From this piece we concluded that VGs work by drawing high energy airflow down into the boundary layer, re-energising the layer and preventing boundary layer buildup over a gradient. The two fences above, however, are covered by the horizontal blade and therefore do not act as VGs. I am assuming that these fences act only to redirect airflow over the shoulder of the sidepod towards the exhaust plume. This could also aid the downwash of the exhaust gases in the same way that a VG would, only on a much smaller scale. On the subject of VGs, I did discuss the possibility of maintaining them for next year’s cars with a few members of the F1 “technical community” on Twitter. The aim of placing VGs and blades on top of the sidepod area is to push the exhaust plume down into floor area around the rear tyre. With the exhaust exiting far away from their current location next year, is there still a need for VGs here? If Ferrari, or any team, were to produce an extremely contoured sidepod there would be a need to place VGs in this area to attempt keep airflow attached along the entire length of the ‘pod. There may well be some radically shaped bodywork in this region next year as the engines are bigger and provide more cooling. This will result in various ways of stacking the intercoolers and radiators that are needed to cool the V6 turbo power units for next year. There were also some subtle changes to the floor for this weekend. These openings at the side of the floor running alongside the sidepod allow turbulent flow from the front tyres to escape without affecting the surrounding flow heading towards the diffuser. The leading opening has been rounded and reduced in size and the trailling one has remained very similar to the previous version. At the base of the sidepod airflow conditioner was a new floor-mounted blade that replaced the ‘r’ vane introduced in Korea. I am unsure if this was just run in practice only or if they carried over to qualifying/race. Kimi Raikkonen ran the short wheelbase edition of the E21 in Abu Dhabi and he will probably continue to do so for the remainder of the season. Raikkonen has not responded well to the long wheelbase (100mm longer) introduced in Italy as it does not suit his driving style. Romain Grosjean has certainly upped his game which has probably amplified Raikkonen’s struggles of late. However the short wheelbase should suit the Yas Marina circuit a lot better, particularly in the tight and twisty final sector. 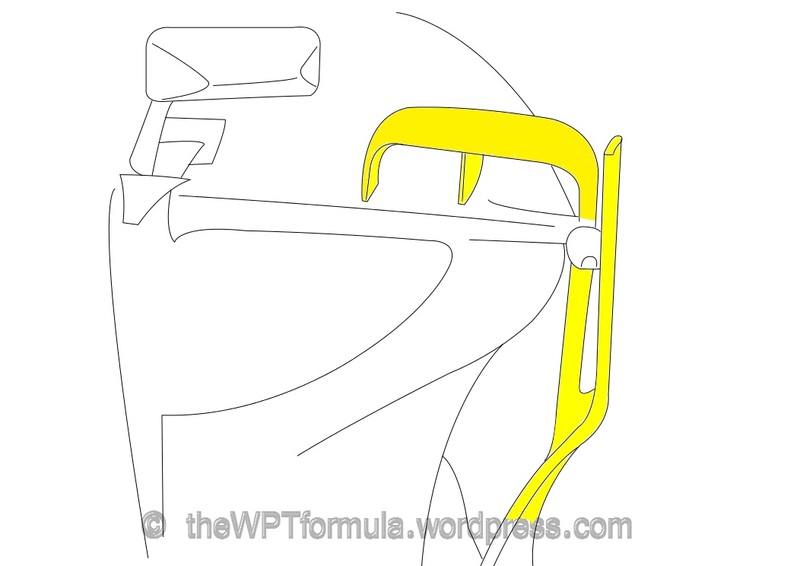 This entry was posted in 2013 Highlights, Technical Highlights and tagged 2013, abu dhabi, f1, tech highlights, updates on November 2, 2013 by thewptformula. I’m not so sure that the device on top of the sidepod is a vortex generator – if it was, they wouldn’t have put an endplate on top of it. That’s true, I’ll have to edit this piece. 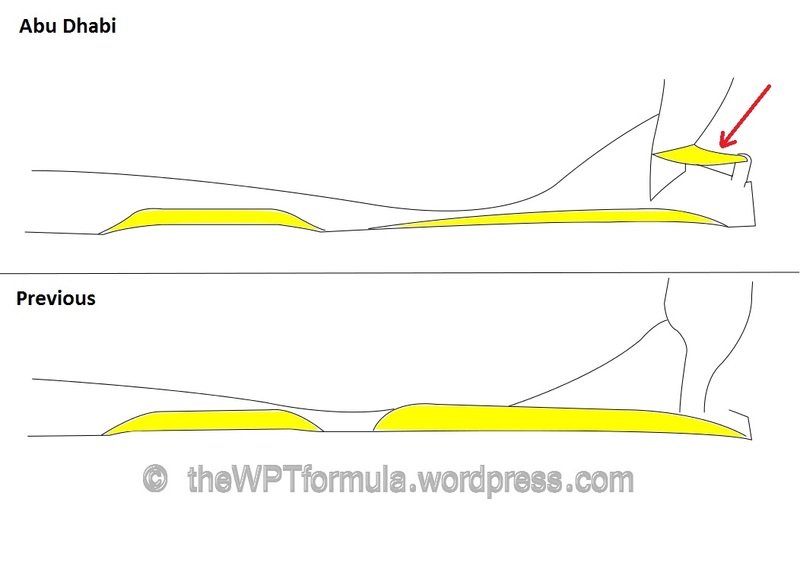 Perhaps the two vanes are there just to straighten the airflow coming over the shoulder of the sidepod, or maybe redirect it to the exhaust plume.